Cut root end off onion and remove peel. Trim ends from zucchini and yellow squash. Medium dice bell peppers, onion, zucchini, and yellow squash into about 1/2-inch pieces. Wipe cremini mushrooms clean with a damp paper towel. Heat about 1 1/2 tablespoons cooking oil in a large pot over medium heat. Add onion and bell peppers to hot pot. Season with salt and pepper; stir. Add zucchini, yellow squash, and mushrooms. Zest half of lemon with a micro-plane (or on small holes of a box grater) over pot with veggies. Squeeze juice of half lemon over pot, avoiding seeds. Add 3 cups water to pot. Once boiling, crumble in vegetable bouillon. Open, drain, and rinse navy beans. Add beans to soup and return to a boil. Simmer 8 minutes, stirring occasionally. Meanwhile, preheat oven to low broil. Cut baguette at an angle into about 1/2-inch thick slices. Broil 3-4 minutes, flipping halfway through, or until lightly browned. Rub whole garlic clove over tops of crostini. Drizzle with 1-2 tablespoons of olive oil. Cook 1 minute, or until lightly wilted. Small dice Roma tomato into about 1/4-inch pieces. Place tomato in a small bowl. Season with a small pinch of salt and pepper. Drizzle with about 2 teaspoons olive oil; stir. Cut remaining half lemon into wedges. 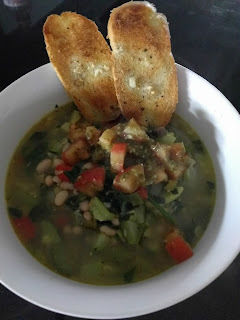 Ladle summer minestrone into bowls. Top with tomato and lemon-basil pistou. Serve crostini and lemon wedges on the side.